The exciting adventure of Mike, Marty and Igor the chameleon was awarded last Saturday the Best Animation Movie Goya, while still pushing through American billboards and in mobile devices via its official apps, developed with Cuatroochenta’s tool 480interactive, with a 100% free and renewed content starting from now. “Atrapa la bandera” manages to still be topical a half year after its release, becoming the third most box-office draw in 2015. The movie directed by Enrique Gato, creator of The Adeventures of Tadeo Jones, shone at the gala of the thirtieth anniversary of the Goya during the same week that it was premiered successfully in Argentina, Uruguay, Peru, Panama, and Paraguay, within an international tour that includes more than 25 countries. In the coming weeks, other premieres will follow in Ecuador, Colombia, Mexico, and Venezuela. At the same time, mobile apps of “Atrapa la bandera” have renewed their games and content, and you can start from now to entirely enjoy them with no costs in versions for Android and iOS. Aftr being placed in Top 5 Entertainment during its launch, Atrapa la Bandera-Oficial y Atrapa la Bandera-El Duelo apps are still catching young and old people with their memory, calculate, and space adventure games. In addition, the fun videos of Briconautas have become a Youtube channel to spread their simple scientific experiments. Apps are providing an innovative concept to the marketing of film industry to connect with the audience through mobile devices. They reinforce the role of the expectation of the trailer before the release and the route of the movie after its analysis, with special attention to children and families who are very familiarized with new touch screens. Atrapa la bandera was produced by Telecinco Cinema, Telefónica Studios, 4 Cats Pictures, and Los Rockets La Película AIE, with the participation of MediasetEspaña, Movistar +, and the collaboration of de AMC Networks International Iberia y Anangu. The animation of the movie is borne by Lightbox Animation Studios and the distribution by Paramount Pictures Spain. 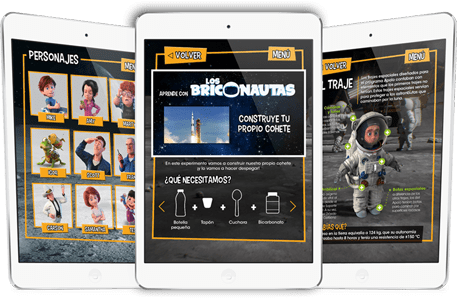 The official apps of the movie are interactive publications developed by the agency Complot with Cuatroochenta’s 480interactive technology.